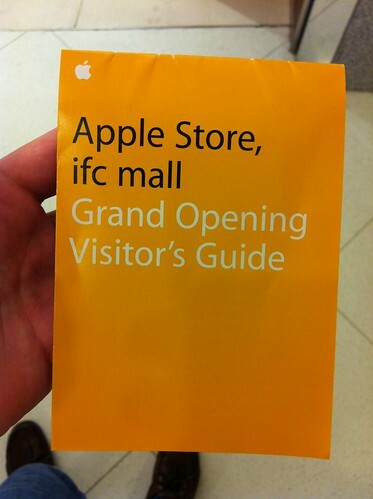 Today, the International Financial Center mall location Apple store on Hong Kong island has opened. 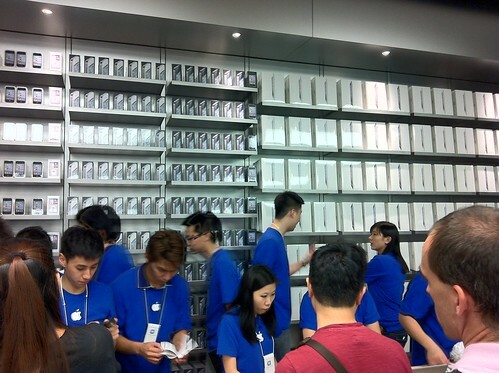 It’s not difficult to get Apple products in Hong Kong. You can order from the Apple store, you can get an iPhone from the wireless companies, or you can get them from various retailers throughout the territory. Even when Apple products had delayed releases in Hong Kong, it was always possible to get grey market products almost immediately, albeit at a steep markup. In fact, impatient for the arrival of the iPad I bought an Australian one from a small retailer in 2010. 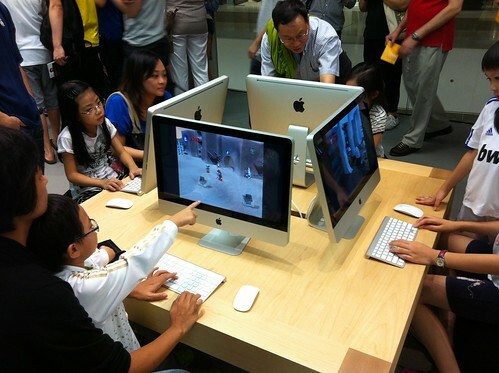 Before today, if you wanted to see new Apple computers in person you could find many small “Apple-style” stores in computer markets across Hong Kong. They didn’t claim to be official Apple stores, but they sold only Apple products and usually had glass windows and nice displays. As Apple opened stores in Shanghai and Beijing, Hong Kongers could be forgiven for feeling a bit jealous of their mainland compatriots. 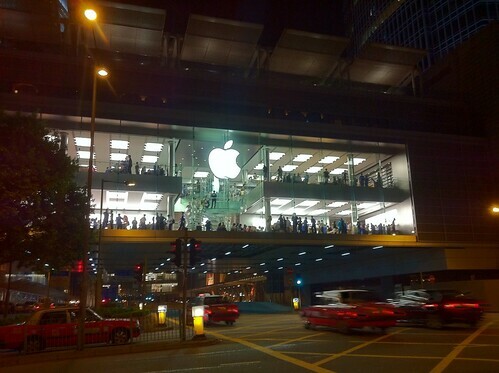 It was easy to get Apple products in Hong Kong, but Hong Kong still lacked it’s own official, physical Apple presence. At long last, however, the wait is over. I didn’t wait in line or even try to show up early in the morning. As much of an Apple enthusiast as I am, I didn’t think it worth lining up merely for the opening of a new store as compared to the release of a new product. I rolled into the store later in the evening around 7:30 PM. At that time there was no line to get into the store but the store was still busy and nearly full. As cynical as I am, the atmosphere of joy and excitement was contagious. At the entrance there was a gauntlet of chanting Apple store staff giving high fives to entering customers. Inside, there were dozens of each kind of product, and it wasn’t hard to find an available device to play with. There was good, upbeat music in the background (I heard Led Zep’s “Ramble On”), and there were many employees wandering around and looking for people to help. There were almost as many security personnel in black shirts as there were staff. Earlier in the day they may have been more necessary for crowd control, or perhaps Apple or the mall administration was actually concerned about possible security problems. I don’t know if this is typical of Apple store openings elsewhere. Despite the huge security presence it didn’t feel overbearing. They just stood against the walls and at the exits, and I didn’t see them speak to anyone or discourage anyone from doing anything. I overheard a few exchanges between Apple store staff and customers, and they seemed as knowledgeable and helpful as I’ve come to expect elsewhere. I doubt Apple had much trouble finding people enthusiastic about Apple products in Hong Kong, and I’m sure the staff had been well trained. I talked to one of them and asked about how they were selling the iPhone’s. They were selling them alone or with contracts on Hong Kong CSL. He asked if I wanted one so I took my iPhone 4 out of my pocket and showed him that I already had one. I told him I was an iPhone developer and that I lived in Hong Kong, so I wanted to check out the new store. He said he had met another app developer earlier in the day who had iOS 5 on his phone, to which I replied by showing him that mine, also, had iOS 5 installed. He tried to sell me a computer or an iPad, but I told him I already had my Apple purchases planned out (iPad with retina display in the spring, etc.) He saidI should come back some time. I read online that they had given T-shirts to the first 5000 visitors. The employee said that they ran out of those in the first couple hours. The store itself is two stories, with a central entrance on the bottom floor. Each floor is split into two areas, and the two floors are connected by a large spiral staircase. The bottom floor had Macbooks on the left side and iOS and iPod devices on the right side. On the top floor there were accessories and genius bars on the right side, and Apple one-on-one teaching stations and purchasing areas on the left side. The top floor has two exits, one on each side. The presentation and organization was almost flawless, and as I said the atmosphere was very upbead. However, in John Siracusa style, I did notice a couple problems. 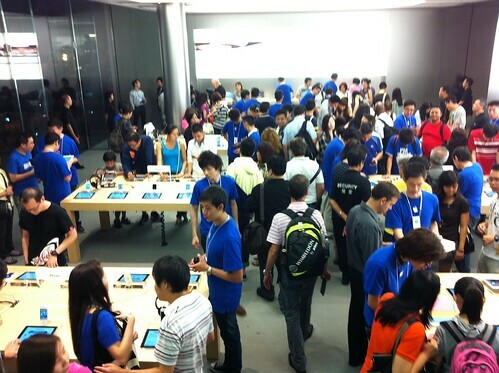 First, they were using iPad’s to give product information. This seems like a cool idea, because pricing and specifications can be updated without having to print out a new information sheet, and also because the customer can explore the iPad menu to find more information about the product. 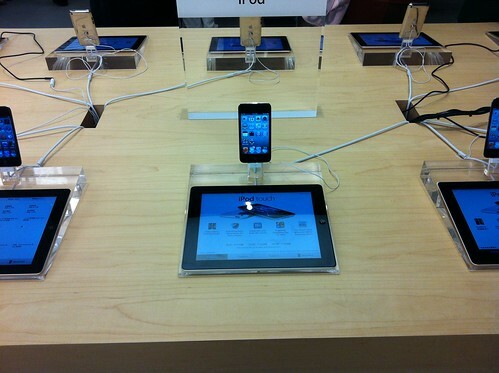 It also helps with cross-promotion, because the customer gets exposure to the iPad. There is one problem with the iPad as product information system: When I first saw the display I thought the product was the iPad, and I was confused as to why they had locked down its interface to make other apps inaccessible. Only after wandering around and looking at other displays did I realize that the iPad was only there to provide information about the iPhone or about the iPod touch. I think the issue is that the iPad’s large, bright display was being used to sell much smaller products (even the iPod nano). My attention was immediately captured by the iPad, and I barely noticed the presence of the iPod touch. When I saw the same sales tactic being used with the Macbooks or iMacs it made a lot more sense. For those, the product wasn’t overshadowed by the information system. Those are a lot of Apples. The second problem was with the dock connector. The iPhone’s and iPod touches were connected to the tables by their dock connectors. They weren’t placed in a standard dock, instead there was some kind of translucent assembly around the connector. Before seeing store staff disconnect one from it’s connector, I thought maybe this was an anti-theft device, and I was uncertain about removing the the iPhone from its position. Using a more familiar dock might make this more apparent. I’m still a little skeptical of the necessity of global Apple retail store expansion. Maybe, as a power-user, I underestimate the usefulness of a single point of contact for support and training. Regardless, the Apple store is a wonderful showcase for Apple products, and as a person living in Hong Kong I look forward to more store openings (perhaps Causeway Bay Times Square, or somewhere in Tsim Sha Tsui?) in the future. A beacon of hope in an otherwise barren landscape of boring technology companies.